The engine of an Air France aircraft has broken up during flight. The plane is known as A380, superjumbo jetliner. It's reported that there were around 500 people on board the aircraft during the incident. It was traveling from Paris to Los Angeles and had to have an emergency landing in Canada. The double-decker aircraft and ended up being rerouted over Greenland. It landed in Goose Bay in Eastern Canada. The landing of the plane also did not have any issues. The real issue lies in the engine that seemed to start falling apart. The cause of this is currently unknown but some people are speculating that it may have been a bird that had collided with it, thus causing serious damage. 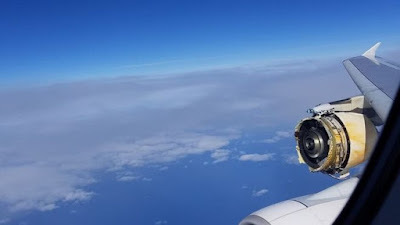 Photos and videos that were apparently taken by passengers showed the engine with its cowling stripped away. While planes require a lot of upkeep incidents such as this one are not very common and it's likely that this aircraft will be fixed soon and will be inspected multiple times to check if there are any issues at all to avoid another situation like this one. Despite the slight issue with the engine that had some damage to it, everyone seems safe and will have more than a unique story to say about this flight. Air France may also be exploring options to get the passengers to the United States.